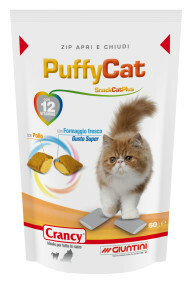 to guarantee all the protein and high digestibility your cat needs. The cheese based filling (with real fresh cheese) contained in the yellow pillows will stimulate his appetite. A carefully selected source of insoluble fibre helps to promote optimal oral hygiene. 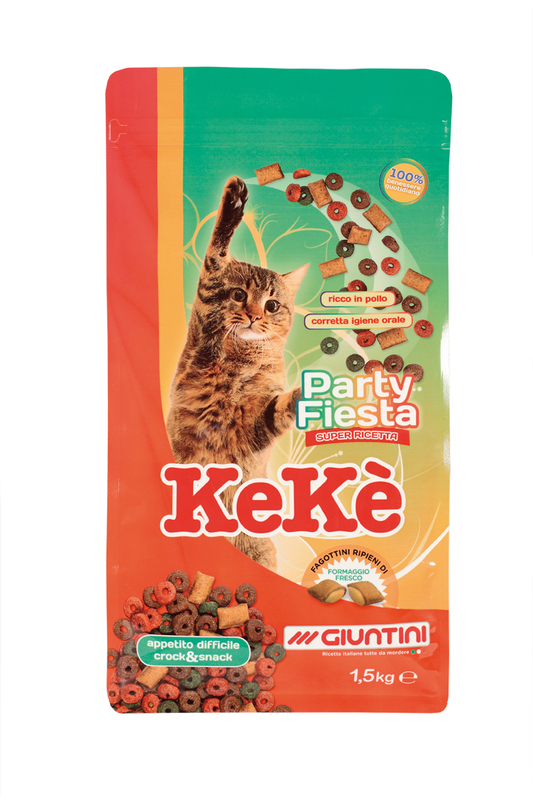 Kekè party fiesta: complete food, tasty like a snack! It can be served dry, or moistened with water (preferably lukewarm). Always allow access to clean, fresh water. Cereals, Meat and animal derivatives (chicken min. 18%), Vegetable protein extracts, Oils and fats, Seeds, Derivatives of vegetable origin (Crude fibre concentrate from natural lignocellulose 1% in cheese pillows), Minerals, milk and milk derivatives (fresh cheese min. 1% in cheese pillows). Crude protein: 30,0%; Crude oils and fats: 11,0%; Crude fibres: 2,3%; Crude ash: 7,9%; Methionine: 0,6%; Lysine: 1,3%; Taurine: 750 mg/kg; Calcium: 1,4%; Phosphorus: 1,0%; Sodium: 0,4%; Fatty acids (Omega 3: 0,45% e Omega 6: 3,3%). 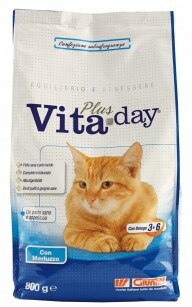 Vitamin A: 22.000 I.U./kg; Vitamin D3: 1.000 I.U./kg; Vitamin E: 130 mg/kg; E2 Iodine: 0,5 mg/kg; E6 Zinc: 11,6 mg/kg.